1 tsp lime juice or just cut a small slice of lime and squeeze it over the pan. Combine beef, soy sauce, sugar, ground pepper,cornstarch, 1/2 of the chopped garlic, and 1/2 of the shallot. Mix well and marinade for at least 15 minutes. Heat oil in a saute pan over medium high heat. Add the other half of the chopped garlic and shallot to the pan. Stir for a few seconds until garlic and onion smell aromatic. Add beef and sear until it’s no longer pink on the outside. ** Then add sweet pepper and onion and stir to mix them with the beef. Sprinkle 1 tsp fish sauce and lime juice over the pan and mix well. Taste and adjust seasoning if needed. When peppers are slightly softened but crisp, turn off the heat, and transfer to a plate. Drizzle the sauce from the pan over the beef and peppers and garnish with cilantro. **With expensive cuts like tenderloin or steak, sear beef until golden on one side (about 1 minute), then remove from the pan and set aside. 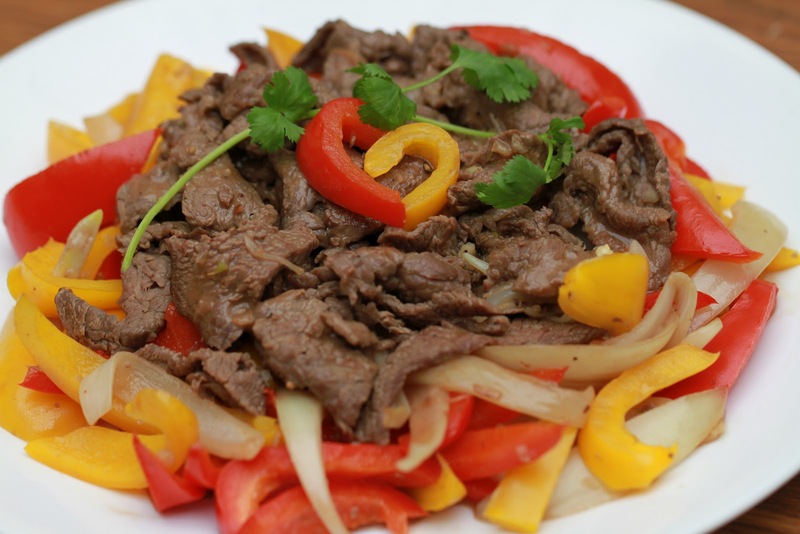 Add 1 Tbs oil into the same pan and stir fry pepper and onion until pepper is slightly soft, then add the beef again. Mix and add seasoning the same way.